The first week the iPad Pro came out, I spoke about it on so many other podcasts, I decided not to talk about it on the NosillaCast. Now that it’s been a few weeks and I’ve had a chance to really use it as my main iPad, I thought I’d give you my impressions from a less gushy, more balanced standpoint. Still with an EVER so slight bias of course but you know what I mean. It’s important when you read or listen to an opinion on a device to understand which device they were using before they got the new hotness, as I believe that is the most significant thing that influences our opinion. Before buying the iPad Pro, I had an iPad Air 1, which has the lovely retina display and the smaller bezel and it’s not terribly heavy, and the A7 processor which is quite snappy. I considered buying the iPad Air 2 because I really wanted that touch ID but the cost to move up so soon was more than I could logically justify.So I’ve got a 9.7″ iPad and I moved to the 12.9″ iPad Pro. 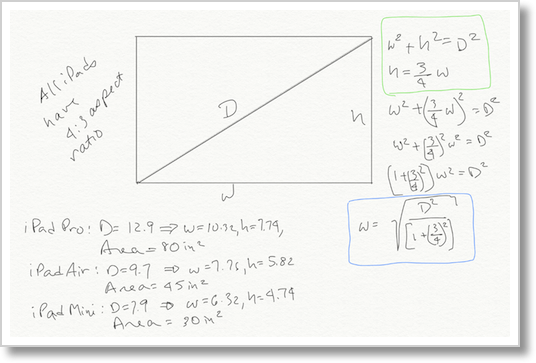 If you didn’t take your high school geometry class as seriously as I did, you might think the iPad Pro screen is around 30% bigger (the ratio of 12.9 to 9.7) but since I loved geometry I sat down and did the cipherin’ to compare the two. We know their diagonal dimensions, and we know they all have a 4:3 aspect ratio so I was able to calculate their areas by solving the two simultaneous equations. Turns out a 12.9″ screen has 77% more screen area than a 9.7″ screen. Let’s make this even more real. 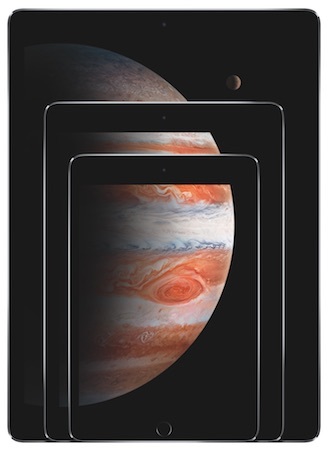 The iPad Pro screen is actually bigger than the screens of the iPad Air and the iPad Mini combined! iPad Pro: 80 in2, iPad Air 45 in2 + iPad Mini 30 in2 = 75 in2. And yes, I showed my work in a diagram in the shownotes. I guess I just took a whole paragraph to tell you that the iPad Pro is BIG. Seriously, it’s huge. After exclaiming about how huge it is, the next thing people notice when I hand it to them is how light it is. Of course it isn’t actually light, at 1.57 lbs it’s 50% heavier than an iPad Air but since it’s so much bigger in screen size, it seems light. You definitely wouldn’t want to hold this with one hand while reading for any length of time. But it is thin. The iPad Air 1 that I have is 0.29 inches thick but the iPad Pro is actually a smidge thinner at 0.27. The iPad Air 2 was thinner yet at 0.24 inches, but I think we can safely say that they’re all incredibly thin. Apple has made an odd decision on the formatting of the home screen. Instead of packing in more icons, they’re just really really far apart. Imagine a screen more than 10 inches wide with 5 entire icons across. 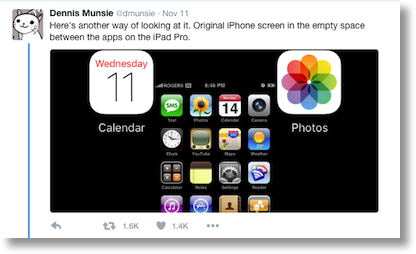 Dennis Munsie pointed out on Twitter that the distance between the icons is bigger than the pixel width of the original iPhone display! There are 324 px between icons on the iPad Pro and the original iPhone screen was 320 px wide. How funny is that? All this screen real estate is swell only if we can do interesting things with it, right? 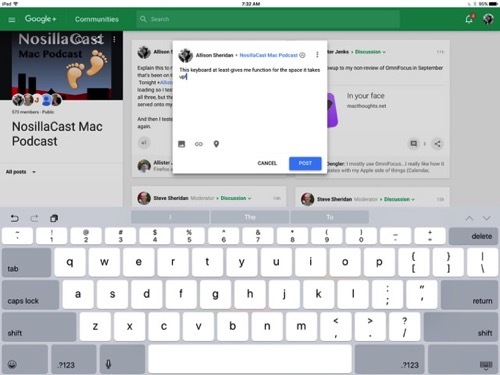 Apple introduced slide over and split screen with iOS 9 that only the iPad Air 2 and the iPad Pro could use. I have not been a big fan of split screen on the Mac, and don’t often slide notifications in from the right, so I was dubious whether these features would bring any real value. Within hours of setting up the iPad Pro with my essential apps, I was in love with Slide Over. Here’s a perfect use case for it. You’ve opened up an app on the giant screen and it asks you for your password. Instead of hitting the home button, opening LastPass or 1Password, getting the password and then reopening or swiping to get to the app you were using, you can use Slide Over. Simply slide your finger from the right edge of the screen and you often see your password manager immediately because you end up using it so often. Once you have your password, swipe back to the right and paste into the app. It doesn’t sound that much easier when I describe it but it’s actually much better from a mental standpoint. Leaving the app and coming back really disrupts your flow of thinking, while Slide Over is like grabbing a piece of paper and setting it back down. Doesn’t disrupt at all. Now what if it wasn’t 1Password you wanted, but your favorite chat app Telegram? At the top of the Slide Over window, there’s a downward chevron. Pull down on that and you get a scrolling window of available apps in Slide Over. It seems to be aware of what you’ve used most recently because I tend to find Telegram, Mail and 1Password in there early in the scrolling view, but I’m worried how this will work when you start to get a lot of apps available in that view. I don’t often truly use multi-tasking by using the split screen view but when I do it works well. To get to split screen, you use the same Slide Over gestures to find your second app, and then there will be a little handle in the division between the two apps. Slide the handle to the left and you can resize the two windows to make them just the way you want them. Another cool feature is that you can hit the home button and launch a new app, and it automatically takes the place of the first app on the left. I really really like the way it works. I say that I don’t use it too often because some apps support Slide Over but don’t support split screen. The way you can tell is if you slide an app over but there’s no handle. I doodle on my iPad in the mornings checking out Facebook, Twitter using Tweetbot, and G+ but of the three, only Tweetbot supports split screen. Let’s talk about apps that aren’t working well on the iPad Pro now that we’ve brought up the subject. G+ just came out with a brand spanking new interface that if the NosillaCast G+ community is a representative sample, is a dumpster fire. I don’t want to dilute this conversation but I haven’t found anything to like yet. Most apps on the iPad Pro support a new keyboard that is delightful. It’s a truly full-sized keyboard, has all of the numbers across the top and gives you dedicated access to what you would expect on a real keyboard. 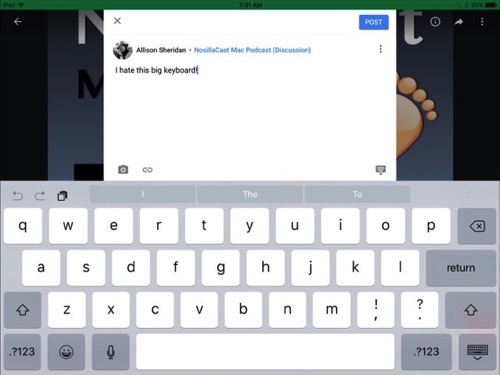 Unfortunately even though Google is offering us this brand spanking new interface they did NOT call the right keyboard, so instead you get the one for the smaller iPads, just expanded to be GIANT on screen. I’m not kidding when I say giant, it takes up fifty percent of the screen. It’s REALLY hard to type on because the keys are so far apart! Facebook uses the old keyboard too. I actually moved both the Facebook and G+ apps to the last page of my home screen and put web apps on my home screen for them anyway, just because in the browser they would get the right keyboard! One of my favorite party tricks to show people is picture in picture with videos. I have the person open the Videos app, and I tell them to open the movie Up from Pixar. I choose this because the brilliant contrasting colors of an animated movie really shows off how great the iPad Pro is for watching movies. After they say “wow” and hear the really good speakers, I show them the button to shrink the movie into a floating window. Then I have them launch another app and have fun moving the window around. I call it a party trick because it gets the amazement factor, but I absolutely never ever use this feature. I simply can’t watch a movie while I’m doing something else, heck I can’t even listen to audio while I’m doing something else. I should mention that one of my major use cases for the iPad Pro is to watch video podcasts. For that it’s absolutely fantastic, it’s basically a bigger TV. We just carry our TV around the house to watch our shows. I don’t have a keyboard for the iPad Pro yet, because I’m holding out for the Apple keyboard. I have zero interest in a keyboard that makes the device as heavy or heavier than my MacBook, so the Logitech seems silly to me. I’m guessing (hoping?) that since I love the MacBook keyboard and I love the new Magic keyboard, the short throw of the iPad Pro keyboard will be good enough for me. We’ll see if I find myself doing more productive things on it when that arrives. The bottom line is that I have had the iPad Pro for two and a half weeks and I haven’t once used my iPad Air. I open it from time to time and giggle at how positively diminutive it is. I thought maybe I would use it at the gym since the iPad Pro is surely too big to tote around and put over the display on the elliptical, but I simply bought a bigger “purse” at the local outdoors store, REI and now I take it everywhere with me. I can’t say you need the iPad Pro but it absolutely fits my needs.